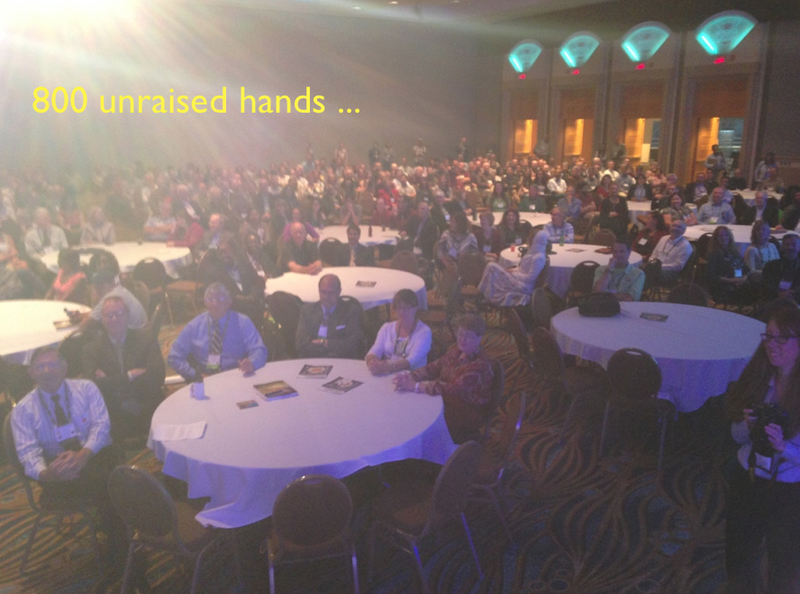 800 unraised hands, all in response to the question I opened my keynote with at the Agronomy/Crop Science/Soil Science meeting. Only one fellow raised his hand and guess who he was — the author of a book on science writing. Science is a narrative profession that is narratively oblivious. I know this in part because I spent twenty years as a scientist and knew zippo about narrative. Which means if I’d been in this audience, I wouldn’t have raised my hand either. EVERYONE WHO RECOGNIZES THE STRUCTURAL TEMPLATE USED FOR ALMOST EVERY SCIENTIFIC PAPER PLEASE RAISE YOUR HAND. SO WHAT IF WE DON’T KNOW THE ACRONYM, WHO CARES? This will be one of the opening vignettes of my new book next year on narrative in the science world. On Wednesday afternoon I gave the closing keynote address to the meeting of the societies for Agronomy, Crop Science and Soil Science at the Long Beach Convention Center. The meeting had 4200 scientists and students in attendance. They estimated 800 or so stuck around for my talk which ended the week. In the first moment of my talk I asked the audience to raise their hand if they were certain they knew the meaning of a certain acronym. I advanced the slides. On the screen was the acronym IMRAD. I scanned the ballroom and even took the above photo for the historical record, proving that no hands went up. But then finally everyone to my left was pointing to one lone individual. That fellow turned out to be Josh Schimel, author of the popular and excellent book on writing scientific research papers, Writing Science Papers: How to write papers that get cited and proposals that get funded. And there you have it — the exception which proves the rule. In case you didn’t know — and I personally absolutely did NOT know until 6 months ago — IMRAD stands for the structural elements of just about every scientific research paper you read — Introduction, Methods, Results And Discussion. So now you know. And you’re maybe saying, “hunh, okay, that’s interesting,” and thinking that’s it. But I’m here to tell you it shows something — the fact that out of 800 scientists only one knew this. And you can add to that sample size the 200 doctors, scientists and students at Johns Hopkins Medical School a month ago when I did the same exercise. Nobody in that crowd raised their hand. And yet, there is an entire sub-discpline of folks who study the IMRAD. Try searching it on Google — you’ll get hundreds of pages of websites talking about it. What this little experiment reflects is the idea that the narrative template that is at the core of how scientists communicate is not even taught in any formal way. There is no one pointing out to students from the first day of their science courses that this is an entire discipline that is built upon narrative dynamics. Science is a narrative profession, both in the doing and the communicating, yet there is very, very little awareness or thought given to it. This is the subject of my book that will come out next year — the identification of this as a serious problem in science, and my recommendations on how to address it.